Founded in 1987, Wade's Woodworking, Inc. has steadily grown into one of the areas largest custom fabricators of architectural millwork and industrial cabinetry. Wade's Woodworking manufactures cabinetry in our modern, state-of-the-art facility located in Xenia, Ohio. Our growth has been founded on the belief of providing an excellent product, backed by service, quality and dependability. We take pride in our uncompromising commitment to provide only the finest workmanship and are dedicated to establishing customer loyalty. Wade's Woodworking, Inc. excels at integrating your equipment and storage requirements into the custom design of your product. 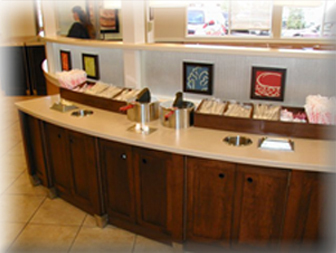 Our experience in millwork covers a wide range of commercial, industrial and retail applications as well as governmental subcontracting. Wade's Woodworking, Inc. is a global manufacturer with our products delivered in over 20 countries around the world. At Wade's Woodworking, no detail is ever overlooked.